So, you’re in charge of a brand new giant AAA video game, and the execs up top are expecting you to drop one of the most slammin’ game designs of 2018 on their desks. What do you do? I’ve played a lot of video games, and if there’s one thing I love, it’s a good enemy. My personal favorite is Halo’s elite, a hulking lizard samurai with energy shields that make a sizzling pop when you shut them down. Facing off against an elite feels like a duel, like you’re going toe to toe with an enemy worthy of both your respects and your bullets. The problem is that too many of the games I’ve played this year, from Fuse to The Order: 1886 to Quantum Break to The Division don’t have any enemies like this. Instead, they all feature the same cliched enemy types. First there’s the dude with a melee attack, the dude with the assault rifle, the medium sized dude with the shotgun, the dude with the cape or cloak and a sniper rifle (sometimes these are ladies), and then the big dude with the minigun or something (these are never ladies). Sometimes, these games will also feature an annoying, small robot enemy. The mix is never exactly the same—The Order features werewolves instead of robots—but it’s similar enough that it’s just as predictable. I get it. It’s easy to differentiate enemies between small/medium/large. A cape on snipers makes sense, because they’re kinda stealthy. The heavy guy should obviously carry the big gun. There is a completely logical reason why all of these enemies should exist, but by this point, they are so common that there is nothing interesting about them. The most interesting enemies I’ve ever faced off in games are more unique than that. Imagine that you’re playing a hypothetical single-player Overwatch game. You’re playing as Pharah, the cool lady in the blue Iron Man suit with a rocket jump ability. 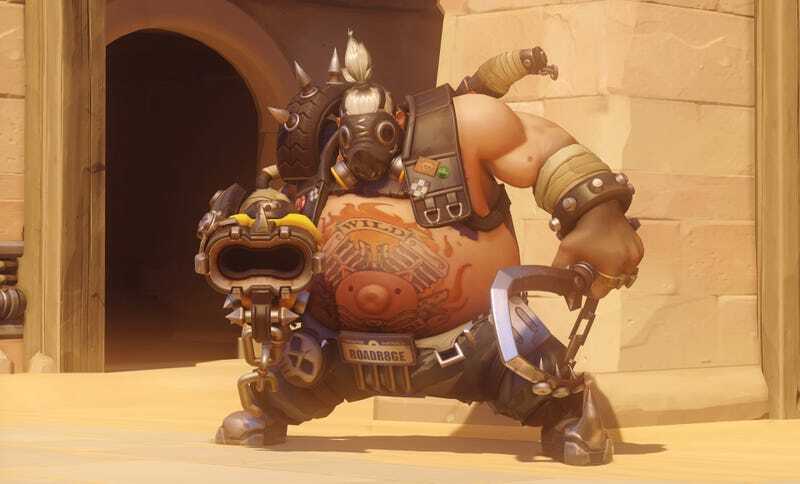 You’re investigating some big explosion, when suddenly, you hear a “Heh Heh Heh, I’m a one man apocalypse,” and BOOM, Roadhog comes stomping through a wall at you, blasting with his scrap gun. You zip up into the air and start shooting, but without much fuel, you start sinking back down. He tosses his hook at you the second you touch down, pulling you in close. You leap away and start blasting with your rockets, but he uses his heal ability while you’re reloading. This is instantly more exciting than a fight with a bunch of dudes with generic guns because, well, they’re just dudes with guns. You’ve probably played enough Uncharted 2 or Tomb Raider to know what kind of uninspiring dudes I’m talking about here. Nothing about the encounter changes. Nothing about the encounter is dynamic. When you enter the fight, you know what everyone can do, and you know nothing will change that. You know what Roadhog can do too, but his abilities are varied enough to keep things interesting. They require more thought. You can’t just hide behind a wall, popping out of cover occasionally, to shoot him. Instead, you’ve got to stay out of range of his scrap gun or dodge his hook or try to stop him from healing up. He’s engaging you more directly, forcing you to utilize the level design to your advantage. Every single one of Overwatch’s characters would be a great AI foe. Pharah would encourage you to be aware of your surroundings, so she doesn’t knock you off into a pit. You’d want to target an enemy Lucio first because of how he buffs his team. An enemy Reinhardt would drive you to use grenades to get around his shields. Another important aspect of good enemies is communication, both audio and visual. Ever notice how Gears of War’s Boomers will shout ‘BOOM’ or Overwatch’s heroes will shout things like “It’s High Noon,” so you can tell what’s going on? Strategically, this doesn’t make sense—it informs the enemy what’s happening and allows them to react. Mechanically, it makes perfect sense: players hate feeling disoriented. The clearer a game is about communicating information to the player, the better. Audio is a good way to do that. However, there’s a problem with audio: when we’re playing games, sometimes we disregard audio cues. Valve discovered this when they were making Portal: players would ignore GLaDOS while they were solving puzzles, because they were busy trying to solve puzzles. Valve chose to limit GLaDOS’ dialogue after that to moments where the player would be sure to listen to her. Sometimes, in intense gameplay, audio cues aren’t enough. That’s where visual design comes in. Anyone who has played Team Fortress 2 or Halo or Doom casually can probably identify the basic enemies based on silhouette alone. Other games struggle with this. I don’t think I can identify any of The Division’s enemies by their silhouettes, except maybe the snipers, because snipers wear capes, even though I love The Division more than most folks and it’s one of my most-played games this year. Great enemy design is clear and memorable, and most importantly, it encourages you to actually make use of the game’s abilities. If the game pushes you into cover, it should have enemies built to drive you out of cover. If the game gives you grenades, it should give you enemies with shields to encourage you to use your grenades. The entire purpose of an enemy in a video game is to make you have fun using all the tools at your disposal. A cliche enemy doesn’t do that. A cliche enemy is just a guy with a gun, whose only strategy is to spend most of his time behind cover. So, if you’re a designer and you’ve just been given free reign over a new first person shooter, and you’re trying to design good gameplay, I implore you: please create memorable enemies who are great communicators that are designed to make me use the gameplay you’ve given me. Thank you in advance.